Editor's Note: It's Friday, my Puddlers, and we are going to throw you a little bit of a change of pace before this long holiday weekend. Now that you have had time to properly digest all of the knowledge you ingested during Nilsson Week (c'mon, admit it—you love Nilsson now don't you? ), as well as to savor the sweet prose from one of my classic, metaphysical posts regarding Jay-Z, my sister and Brooklyn in the Barclays Center Era, we are now going to cleanse your palette with an actual recipe from a good friend of the blog, Ally-Jane Grossan, also known as Kitchen Princess. At Skidmore, Ally-Jane and I used to work at the literary quarterly Salmagundi and we've stayed friends ever since. Now, she has her own blog where she provides quality recipes as well as the occasional "Star Wars" reference. So feel free to check out her blog whenever you have a chance (read: NOW!) and then check back here next week. We're going to have some sporadic posts until the week of 10/22 when the blog will be completely devoted to PREVIEWING THE 2012-2013 NBA SEASON. Now, read, learn and then get the hell out and try to enjoy one of the last truly pleasant, Indian-summery weekends of the year. This dish, which can be vegetarian or include pan-fried chicken or shrimp, is killer for a quick dinner. It’s quite healthy, really refreshing and also easy. I’m not always the biggest fan of cold pasta salads, but this one is different. It’s like a deconstructed Vietnamese Summer Roll and about 100 times easier to make. Vietnamese rice noodles, often called vermicelli are great because they cook in about 2 minutes. I would recommend making them the night before so they have time to cool…or even in the morning before you leave for work since all you need is some boiling water. You’ll also need fish sauce which smells gross, but lends a really complex tart flavor and its fishiness is drowned out by the lime juice. You’ll need a bunch of herbs for this, so plan to make pesto or chimichurri (or cocktails for that matter) with your left over cilantro and basil. Or even better, use the exact same ingredients, add rice paper wrappers and you've got Vietnemese Summer Rolls. I'll show you how over on my blog, Kitchen Princess. 1. If you're going to use shrimp or tofu, heat the sesame oil in a medium skillet. Fry the shrimp until pink or the tofu until crispy (about 3 minutes for shrimp and 5 minutes for tofu). 2. In a medium-sized pot, bring water to boil for the noodles. They only need to cook for 2-3 minutes. Either strain them or remove with tongs. Set aside to cool and sprinkle with a splash of sesame oil to prevent them from sticking. 3. In a small cereal-sized bowl whisk together the garlic, ginger, chili powder, fish sauce, lime juice, agave and sesame oil. Add 1 Tablespoon of water and see if you like the taste. If you do, great. If not, add more water and perhaps more lime or agave. Set aside. 4. 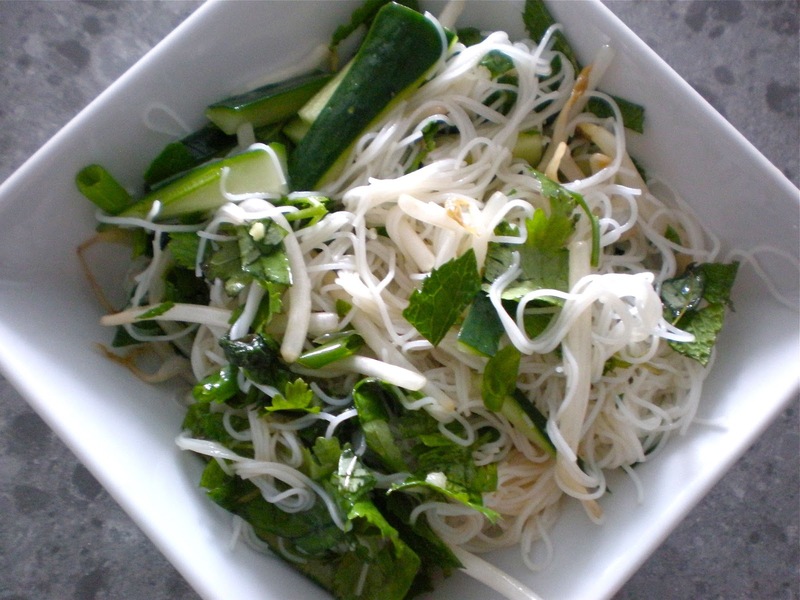 In a large bowl, toss the noodles, cucumber, basil, cilantro, mint, bean sprouts, tofu or shrimp together. Add the dressing and using two forks, toss to coat thoroughly.